at Wired.com. This is not Kyle. My latest newspaper column applies to half the population. Well honestly, I guess it applies to everyone since half the population gets themselves into these situations and the other half has to deal with it. Thanks for stopping by the site, and I hope you enjoy the article. One morning recently a first grader approached me, proud as a peacock and strutting his new feathers. Stitches, right on the bridge of his nose, there for all the world - and his own crossed eyes - to see. Seems Kyle and his siblings were playing an age old game, nameless to the best of my knowledge, that involves throwing stuff up in the air and watching it fall. His sister threw a baseball bat-sized stick in the air, and they all watched it hit a home run on the downswing, right between Kyle’s eyes. A first-ever, first-grader, four-bagger. Kyle’s fine. Ask him, he’ll tell you. And it’s cool, he’ll say, cause the nurse told him chicks dig scars. But just imagine. One inch right or left and suddenly he’s Captain Kyle, Curse of the Classroom, Scourge of Scholars, and he’s being fitted for an eye patch. Quick. Name a boy, old or young, with a noticeable scar and a story to match Kyle’s. Easy, right? 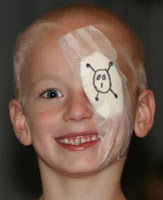 Now name a boy or a man who’s actually lost an eye. Ralphie’s mother in A Christmas Story wasn’t the only mom to say, “You’ll shoot your eye out!” (Or “poke your eye out” or “put your eye out.” Same thing.) But truth be told, none of us ever did. Remember Chicago Bears quarterback Jim McMahon? Remember the ‘85 Bears, the Super Bowl Shuffle, the attitude? Remember the sunglasses? Turns out the sunglasses weren’t just his attitude on display. McMahon’s right eye was extremely sensitive to light. See, when he was six he tried to undo a knot in a toy gun holster he was wearing. With a fork. Get that image clear in your mind’s eye and you don’t need to hear the rest of the story to know what happened. The fork slipped, entered his eye, and severed the retina. Even boys who actually do poke themselves in the eye can’t manage to poke the eye out. It’s like half the population is creative (or stupid) enough to get themselves into these eye-popping situations yet not talented enough to close the deal. Scars are to boys like words are to the blank page. Neither starts out marked, but both are incomplete without the unique stories etched upon them by their owners. When I was kid I stood on a chair to reach something on the top shelf of a closet. Instead of removing the items weighing it down, I tugged and pulled. My hands slipped and back I went until my head hit the corner of the coffee table. Blood? Yep. Scar? You bet. Dumb? And good thing. Had I thought about what was happening, I may have turned to see where my head was headed. Probably would have lost an eye. 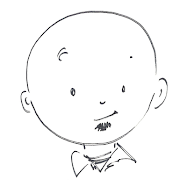 Geoffrey Hayes, 2010 Geisel Award winner for Benny and Penny in the Big No-No!, is back with a new Toon Book featuring Patrick, a new character that beginning readers will love. But while the book and the characters might be new, the enjoyment that Hayes and Toon Books brings to young readers is exactly the same. 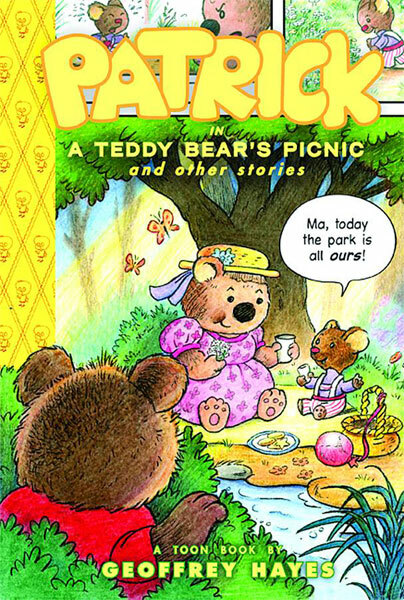 The first story, A Teddy Bear’s Picnic, features Patrick enjoying a picnic in the park and his mother trying to keep up with him. Birds get chased, balloons get popped, boats get sailed, and bugs get away. Even rain can’t spoil Patrick’s fun. He finds puddles and wet clothes, and Ma finds a way to make their picnic happen despite the rain. After both of Patrick’s adventures, Ma says he needs a nap. Picnics and cookie-runs can wear a boy out! 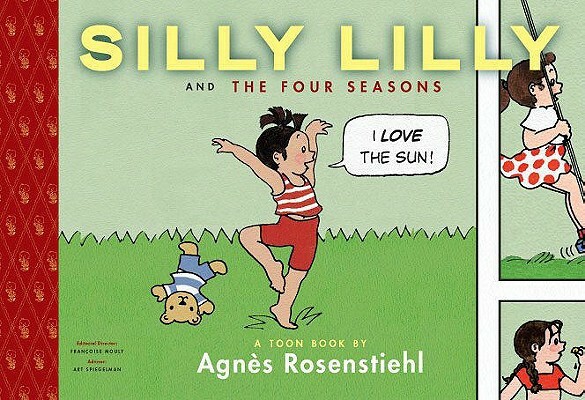 These two nap stories, each only a page or two long, express the feelings of every child still stuck with nap time. Nap! Why? Young readers will need to use all their story reading skills to find success. While the text is not overly difficult (Level 2 or Grades 1-2 according to Toon Books’ three-leveled scale for their books), Patrick’s actions move quickly, forcing readers to frequently make inferences between frames. Readers need to look closely within each frame as well. Patrick’s personality is on display, not in what he says, but in his facial expressions, his puddle jumps, and his speedy movements. 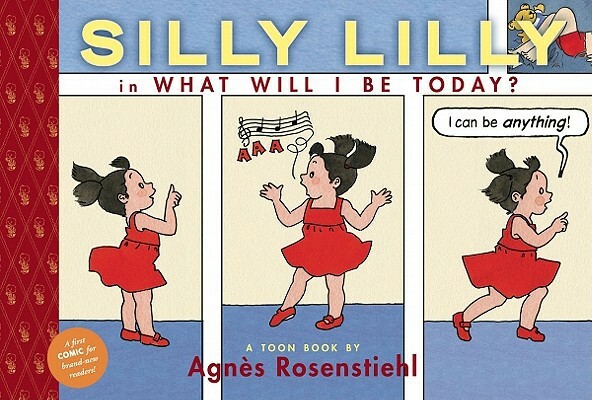 The book also offers parents and teachers advice on reading comics with kids. Several tips are included like using a finger to follow the action, how to make the story come alive with sound effects and role sharing, asking questions, and watching the action in the panels. But in the end it’s not advice for grown-ups or Toon Books’ leveled system or their numerous online resources that make Patrick in A Teddy Bear’s Picnic a great addition for beginning readers. It’s the engaging characters and fun stories that will bring readers back for reread after reread.